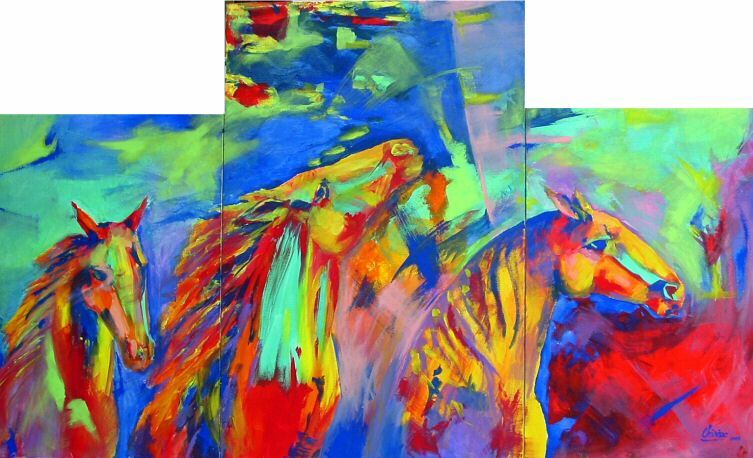 Why a new contemporary abstract expressionist painting, triptych painted by Chiriac, me, is an unbelievable thing? Well, if you take a look on my paintings gallery page, you’ll see that the main paintings gallery is that of the realist and surrealist art. The abstract art gallery is the last one and its description says that I abandoned the contemporary abstract style back in 2006. 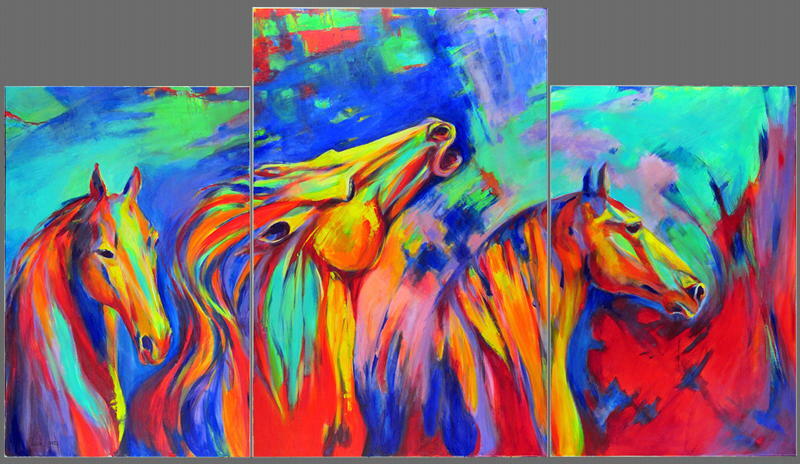 It’s a very large triptych artwork , acrylic on canvas. It was very exciting for me to return to my artistic beginnings and encouraged by such a great reaction regarding one of my old abstract painting, it wasn’t a big surprise to accept this commission. Also, the commission came in a moment when I was thinking of my abstract artistic period and was getting nostalgic of those times and thinking that would be nice to paint something abstract or something else contemporary which don’t ask to much planning and strictness as realism and even surrealism ask for. The extincting was so great that I started to paint the new triptych artwork before to receive the advance payment. First of all, because all that excitement blinded my vision and I painted like crazy…and I thought it was finished, like a crazy, too! 🙂 I would post that picture of the new triptych when I thought it is finished if I am not too ashamed by it ( yet, it can be seen in the video clip)… It had almost no connection with the old one! yet, I was happy with it … I repeat: I think I was blinded. My eyes were opened by the commissioner’s email which was very sincere. Second, I didn’t think of my present capabilities of doing abstractions. The years of realism put their mark over my style! and even if I didn’t want to keep a real shape of horses, they came out naturally. Third, I didn’t count the need of a large space in order to paint such a large artwork. And 4th, I forgot that one never can to transpose in the same mood like that of many years ago, which I think is essential for the abstract art. So, even that I make the necessary changes in that new painting which I was thinking is ready and bringing it then to a look that resemble the old painting, (and I have to say this new one I like more than the old one) the “hot time interval” of making a new sale was gone and I lost this commission. It was my own fault! If were possible to continue it, I’m sure I would get the new abstract triptych to very look like the old artwork. Yet, the return to abstract was a nice experience, though, I don’t think I will repeat soon. Also, because I prefer to keep my customers as happy as possible, maybe is a good thing that things were happened like they happened.